Many call themselves Christians, but Christ said, “Follow Me,” so what does it mean to follow Christ? You never heard Jesus refer to His followers as Christians, but rather, He would call them His disciples, and when He called His disciples, He would often say: “Follow Me.” When Jesus saw “Simon (who is called Peter) and Andrew his brother, casting a net into the sea, for they were fishermen. 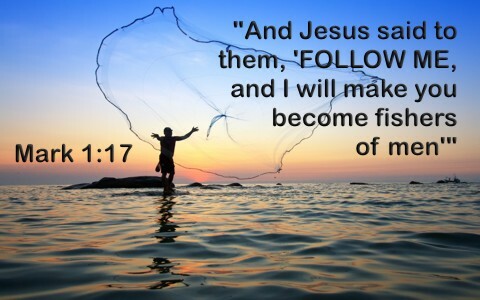 And he said to them, “Follow me, and I will make you fishers of men” (Matt 4:18-19), and what was their reaction? Did they stop and think about it? Did they consider the fact that they’d be leaving behind the family fishing business and all the security that went with that? And, what about their family? Couldn’t they have at least said “Goodbye?” No, the Scripture says “Immediately they left their nets and followed him” (Matt 4:20). Wow! That’s a radical thing to do. And while Jesus was at the shore, He “saw two other brothers, James the son of Zebedee and John his brother, in the boat with Zebedee their father, mending their nets, and he called them. Immediately they left the boat and their father and followed him” (Matt 4:21-22). Again, it was an immediate decision. That’s what it means to follow Christ. You drop everything and follow Him, no matter what it costs you. That doesn’t mean you quit your job and leave your family, but that does mean you seek first the kingdom and His righteousness (Matt 6:33), and that is found in the King of the kingdom, Jesus Christ (2nd Cor 5:21). Not everyone responded immediately by following Him, and that made a huge difference. It’s the difference between those who profess Christ and those who follow Christ. Jesus never promised eternal life to those who profess to be Christians, because many will claim they know the Lord but Jesus will tell them plainly, “I never knew you” (Matt 7:21-23). A person can say they’re Christian, but Jesus defines believers as being His disciple. It is not about what you say, but about what you do. He says, “whoever does not take his cross and follow me is not worthy of me” (Matt 10:38), and wearing a cross around the neck isn’t what Jesus had in mind. Christ says, “If anyone would come after me, let him deny himself and take up his cross and follow me” (Matt 16:24). Jesus made this offer to the rich young man and told him, “If you would be perfect, go, sell what you possess and give to the poor, and you will have treasure in heaven; and come, follow me” (Matt 19:21), but “When the young man heard this he went away sorrowful, for he had great possessions” (Matt 19:22). He was not ready to follow “immediately,” and his eternal destiny was likely changed. When Jesus began to preach some very hard things to the crowd, and many of His disciples could not take it anymore, it says, “many of his disciples turned back and no longer walked with him” (John 6:66), but if they truly believed that Jesus was God and the Savior, they would have walked with Him no matter what He said. Even the Apostle Peter realized this and said, “Lord, to whom shall we go? You have the words of eternal life” (John 6:68), even if Peter didn’t understand all the “words of eternal life” (which none of them truly did at the time). I would rather call myself a Christ follower than a Christian because the word “Christian” seems to be too generic. I mean, the man down the street who swears profusely and is always getting drunk in public claims he is a Christian while he is sober, but that doesn’t mean he is following Christ. He never goes to church, never reads his Bible, and his language, even while he’s sober, he seems to betray his profession of faith. From what I can see, he isn’t following Christ but being led by the flesh. If you truly want to follow Christ, then you will share in the sufferings of Christ, as the Apostle Peter wrote that we should “rejoice insofar as you share Christ’s sufferings, that you may also rejoice and be glad when his glory is revealed” (1st Pet 4:13). This Apostle Paul wrote that “as we share abundantly in Christ’s sufferings, so through Christ we share abundantly in comfort too” (2nd Cor 1:5), and this was in order “that I may know him and the power of his resurrection, and may share his sufferings, becoming like him in his death” (Phil 3:10). To follow Christ, you must know Christ, and only then can you follow Christ. Our neighbor down the street never did suffer persecution for his faith, but maybe that’s because he never had authentic, saving faith. If you want to follow Christ, you must believe what Christ said, and He promised, “If they persecuted me, they will also persecute you. If they kept my word, they will also keep yours” (John 15:20), “and you will be hated by all for my name’s sake. But the one who endures to the end will be saved” (Matt 10:22). Christ followers know that none were ever hated like Jesus was, so “If the world hates you, know that it has hated me before it hated you” (John 15:18). It isn’t a matter of persecution happening to most of us, but it says, “all who desire to live a godly life in Christ Jesus will be persecuted” (2nd Tim 3:12), so Jesus doesn’t promise that we’ll all be happy, but they will persecute us, because they persecuted Him; they will hate us because they first hated Him; and all will be persecuted “who live a godly life in Christ,” or they’re not living that kind of life at all. It is such a radical devotion to Christ that our love for Him will look like hatred to our family by comparison, as He said, “If anyone comes to me and does not hate his own father and mother and wife and children and brothers and sisters, yes, and even his own life, he cannot be my disciple” (Luke 14:26). To follow Christ means to suffer with Christ and to suffer the same things as Christ did, although not at all to the same extent (Isaiah 53), but our sufferings may include being ostracized, hated, and despised. Do you still want to follow Him? Jesus says we must count the cost (Luke 14:28), but “Whoever loves his life loses it, and whoever hates his life in this world will keep it for eternal life” (John 12:25). If you have never trusted in Christ, today He says to you, “Follow Me.” I pray you will do that “immediately,” because those who believe in Him shall never be put to shame, so to whomever has ears, Jesus says, “I am the resurrection and the life. Whoever believes in me, though he die, yet shall he live, and everyone who lives and believes in me shall never die. Do you believe this” (John 11:25-26)? Read the “red” letters KJV end to end if you want to know what Jesus Said and meant, it is The Word of GOD. “Follow Me” is to become the Son of GOD by your Free Will and what YOU DO? Luke 6:46 And why call ye me, Lord, Lord, and do not the things which I say. Your statement that “to ‘Follow Me’ means to become the Son of God is not true. There is only one Son of God and Jesus is it, not you nor me sir. Previous post: Is Acupuncture Or Acupressure Allowed In The Bible? Next post: How Were People Saved Before Christ And The Cross?